For millennia, ancient peoples of the Andes created quipus—complex record-keeping devices, made of knotted cords, that served as an essential medium for reading and writing, registering and remembering. 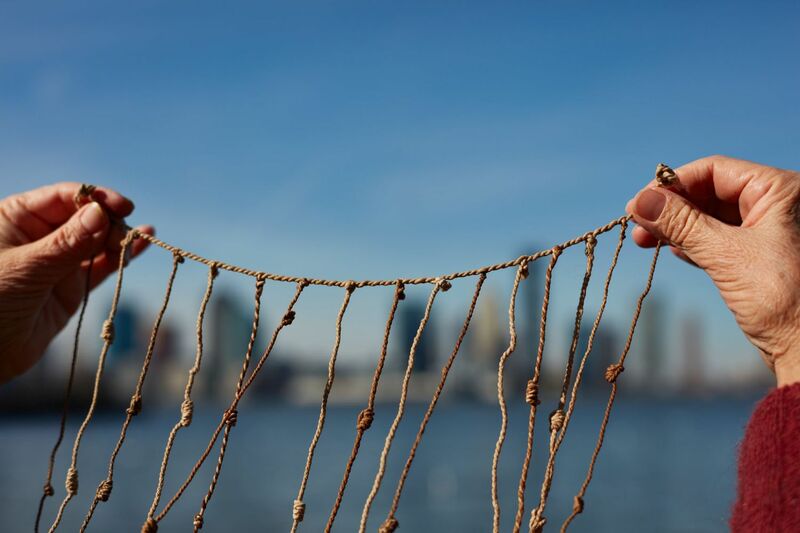 New York–based Chilean artist and poet Cecilia Vicuña has devoted a significant part of her artistic practice to studying, interpreting, and reactivating the quipus, which were banned by the Spanish during their colonization of South America. Drawing on her indigenous heritage, Vicuña channels this ancient, sensorial mode of communication into immersive installations and participatory performances. Disappeared Quipu pairs ancient quipus from our collection with a newly commissioned installation by Vicuña that combines monumental strands of knotted wool with a four-channel video projection. Together, these quipus of the past and present explore the nature of language and memory, the resilience of native people in the face of colonial repression, and Vicuña’s own experiences living in exile from her native Chile. Each knot of Vicuña’s modern-day quipus gives radical possibility to the connective and expressive capacities of a language nearly lost to history. On view in the adjacent gallery are thirteen ancient Andean textiles selected by Vicuña from our collection. Featured in the artist’s video projection, these textiles span a period of fourteen hundred years and complement Vicuña’s installation by honoring an important indigenous artistic tradition. Cecilia Vicuña: Disappeared Quipu is organized by the Brooklyn Museum and the Museum of Fine Arts, Boston. The Brooklyn presentation is initiated by the Elizabeth A. Sackler Center for Feminist Art, and is organized by Catherine Morris, Sackler Senior Curator for the Elizabeth A. Sackler Center for Feminist Art, and Nancy Rosoff, Andrew W. Mellon Senior Curator, Arts of the Americas, with Serda Yalkin, Curatorial Assistant, Arts of the Americas and Europe. The MFA presentation is organized by Liz Munsell, Lorraine and Alan Bressler Curator of Contemporary Art, and Dennis Carr, Carolyn and Peter Lynch Curator of American Decorative Arts and Sculpture. Gary Urton, Dumbarton Oaks Professor of Pre‐Columbian Studies at Harvard University, is a collaborative consultant to the project. Robert Kolodny and Ricardo Gallo respectively, created the video projection and sound design of the work. Leadership support is provided by Elizabeth A. Sackler. Generous support is provided by the Horace W. Goldsmith Foundation and the Kaleta A. Doolin Foundation.